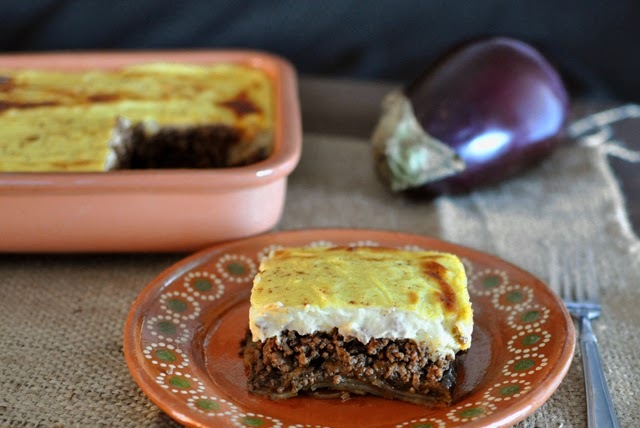 Growing up I thought Greek Moussaka was something that was made with layering tons of sliced potatoes and boiled eggs. Problem was that until very recently I had a deep dislike of boiled eggs and could only eat them in french salad because I pretty much couldn't taste them in it. But! As things happen in life, I made just the right thing with boiled eggs, my green beans and eggs salad and realized they could be more than delicious. I still don't go eating a boiled egg just because, specially by itself, but I'm not fishing them out of Cobb salads anymore, and I eat them more and more in salads at home as well. It's all good with the boiled eggs now. 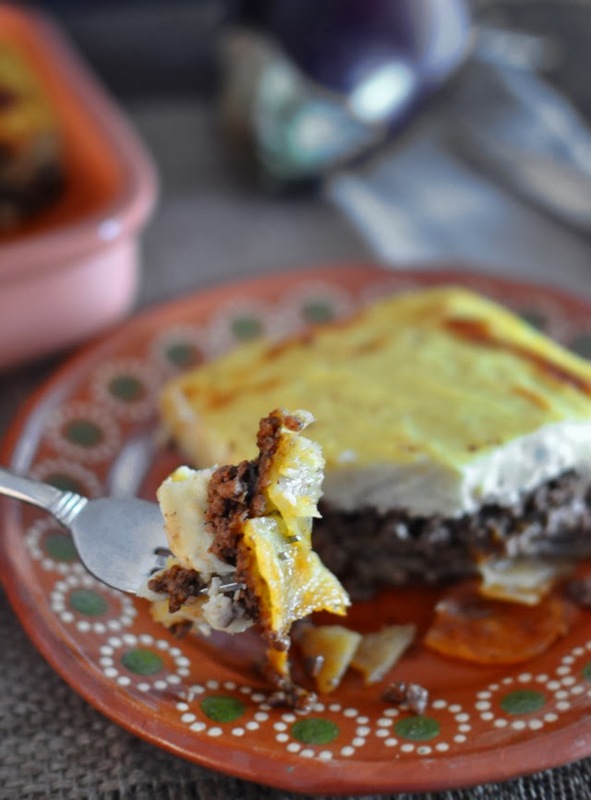 I am a little upset though, that when I actually went to Greece, I avoided Moussaka like plague thinking that it was a dish with eggs and potatoes. It turns out it is not. It turns out it is most traditionally made with eggplants, which I adore, and many other ingredients that are among my favorite foods. I did, however, eat a ton of Gyro's while there so that helps. It also helps I was there ten years ago. That though, makes me feel old. Not old old, but old. Greek food has a lot similarities with Croatian food, we love our fish, we love our olive oil, salads and vegetables, all of the Mediterranean goodness so I was very happy to discover Aristo's restaurant a couple of years ago. It is a nice place in SLC up by the U of U and since discovering it, we go there often. I've tried a lot of the stuff from the menu, but Moussaka is my favorite. Guy Fieri was there taping for Food Network just a few weeks ago, so I'm quite sure they will get even more busy. I don't want it to be too busy though, it's one of my favorite places in town, I want to be able to get a table there without waiting for two hours! 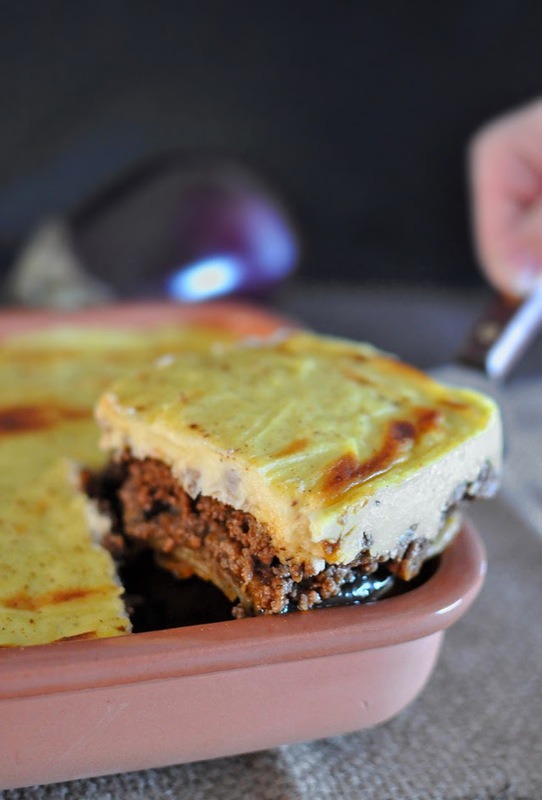 My love for this Moussaka was so great that I tried recreating it at home, and this is a result. I am very happy with it, it may not be completely the same, but it is very close. 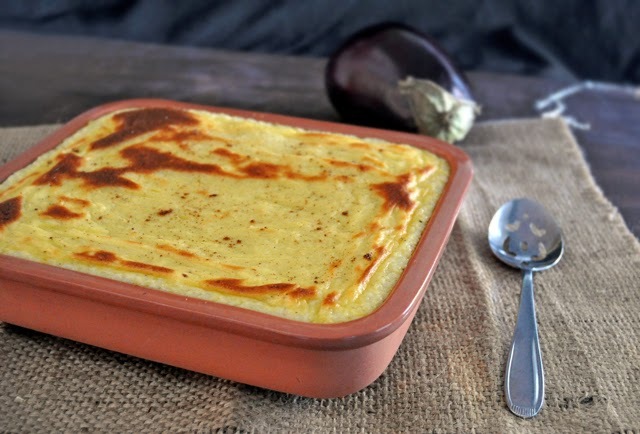 If you like Béchamel and lamb and eggplants, don't miss out on this one! Sautee the onions on olive oil and when it becomes translucent add the garlic to it. Continue cooking for about a minute constantly stirring and then add the lamb and the beef to the pan. 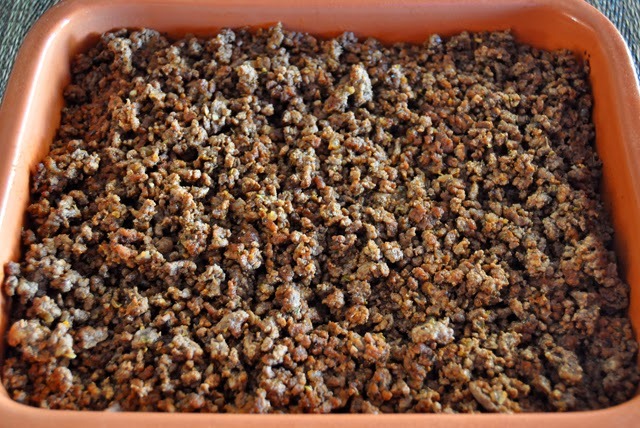 Season with salt and pepper and cook stirring occasionally until it is evenly browned. Add your wine and all of the spices and let it cook out, hen add the tomato paste and sauce and cook for another five minutes or so. Add warm milk to mixture, whisking continuously. Add the cheese. Simmer over low heat until it thickens but does not boil. Remove from heat and stir in beaten egg yolks. Add pinch of nutmeg. If sauce still needs to thicken, return to heat and cook over very low heat while continuing to stir. Poke the sliced eggplants with a fork and season it with salt on both sides, put on paper towels and let sit for about 20 to 30 minutes. This will help with the bitterness of the eggplant and with the excess moisture. Pat dry well with more paper towels and then brush them with olive oil, season with pepper and cook them in a pan (grill pan if you have) on each side until they are nicely browned. 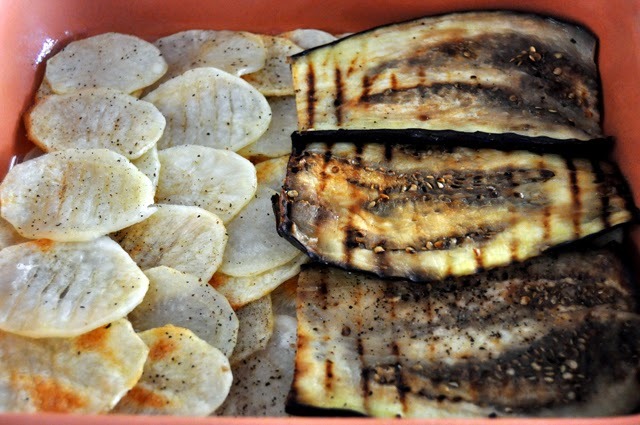 Brush the potato slices with olive oil, season with salt and bake in a single layer until they start to brown lightly. 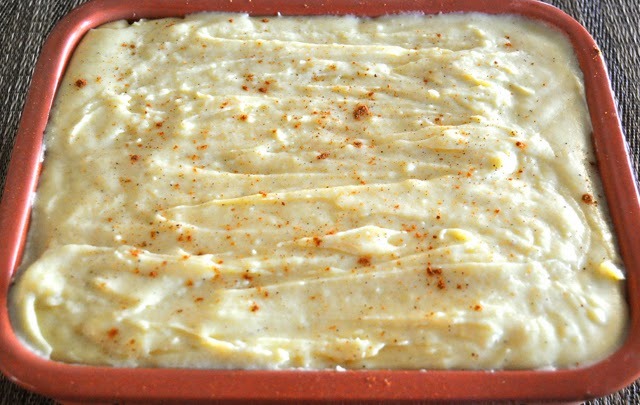 You could boil the whole potatoes and slice them and just layer them as well and it would save some time, I just like the baked and roasted flavor a bit more. Pour the Béchamel sauce on and sprinkle it with a pinch of nutmeg. Bake for about 45 minutes on 350 degrees until the top is a nicely golden brown color. Let me tell you, that Béchamel on top is something else! You can serve a nice light Greek salad on the side or even just sliced tomatoes with a few drops of olive oil and Balsamic vinaigrette. Enjoy!